Arguably the biggest shift in TV drama over the last years has been the rise of the Scandi noir. We Brits always love a murder mystery, but then The Killing came along it changed the TV landscape. We fell in love with the Scandi gloom, the atmosphere, the excellent acting and brilliant script. After The Killing came a flood of dramas, including Wallander, The Legacy, an Anglo-French version of The Bridge called The Tunnel, and of course, The Bridge. Series 3 of the police drama set a new bar for gritty, grimy murder mysteries, with its deep psychological edge. The question was whether series 4 could meet the same high standards? The Answer is a resounding yes. 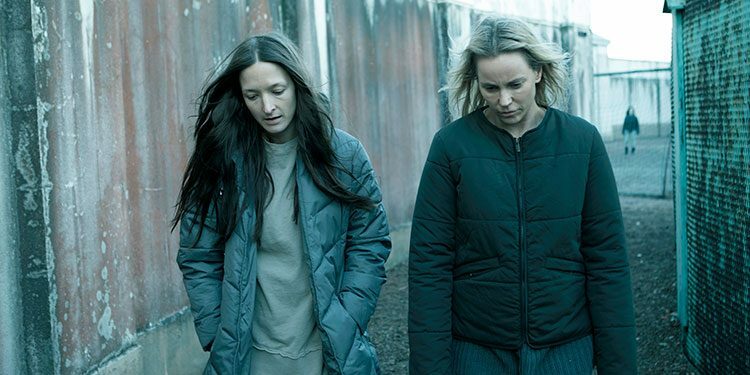 We find Sofia Helin’s Saga, poor, tortured autistic Saga, in prison. However, when a leading politician in charge of immigration is found stoned to death she is released and put on the case with her old sparring partner, Henrik (Lindhardt). He is still obsessing over his missing daughters, and it’s no great surprise when a couple of teenage girls, arrested for pickpocketing one of the suspects, start to bond with him and he takes them into his home, much to Saga’s annoyance. She meanwhile is in therapy, a situation handled not only sensitively but in a way that drives through a critical plot point. She is still obsessive about doing the right thing, and still offending everyone who doesn’t need to hear the truth. One scene where she points out the parentage of a baby is pricelessly funny. The murders meanwhile keep racking up, all with different means – electrocution, hanging, poisoning – what could be the connection? And why are we seeing repeated scenes of a creepy utopian village run by a controlling woman? The Bridge is all the things you could want from a murder drama, but with huge amounts of depth and psychological insight. It’s genuinely creepy – haters of clowns might want to fast forward through one particular scene – but there’s lots of room for character development dealing with loss, addiction, and the sheer agony of losing a loved one. Of course while we had Sofie Grabol’s jumper in The Killing, which became so iconic it features on the box set re-released on the same day as The Bridge. However, The Bridge has its own trademarks. Helin’s leather trousers and huge coat are in almost every scene, and we finally find out how she got that unusually-coloured Porche. Overall Verdict: Quite simply the best murder procedural on the telly this year. If you have never seen it you can but the box set of series 1-4, and on the same day why not treat yourself to The Killing, Borgen, The Legacy and Wallander too. It’s absolutely worth it. Well done our Scandi chums, and keep them coming.